Women's Resale is an annual adult consignment sale event presented by Rugrats Resale that specializes in adult clothing: Women's, Junior's, Maternity & select Men's clothing of all sizes. Women's Resale also offers shoes, accessories, books, and select decor. The sale event operates over a 3 day period; an invitation only Presale day, a Public Sale day, and Half Price Sale day. The event is held at Penn Skates in State College, PA.
Shop Women's Resale early! Volunteers and Consignors get to shop before anyone else. A limited number of tickets will be sold for Women's Presale. Each item for sale at Women's Resale will have an item tag. 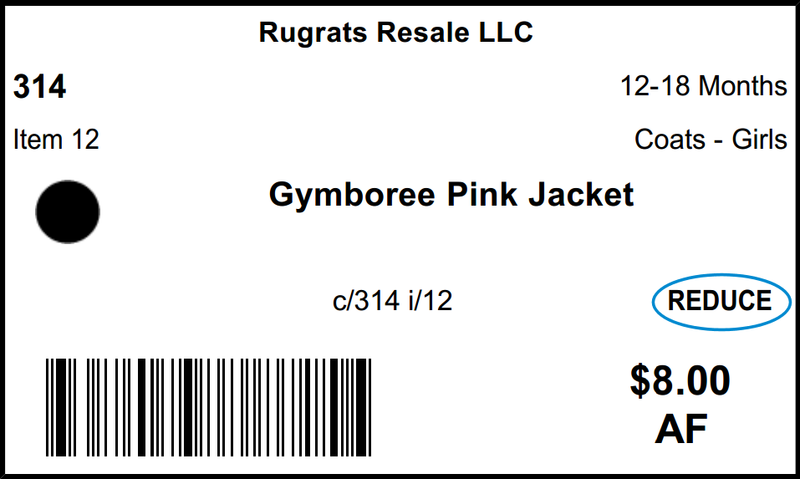 This tag keeps track of which Consignor the item belongs to.